Urban Pirates will be holding auditions for Performers (actors and actresses) for our interactive Pirate-themed cruises aboard the pirate ship running out of National Harbor. (Day and evening shifts available, hours and working dates can be flexible). Urban Pirates is a great job for college theater/arts students, camp counselors, or recent grads. 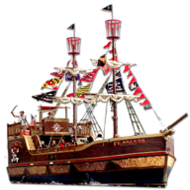 No pirate experience or elaborate costumes required, Pirates will be trained. Crew is paid an hourly wage plus tips. Urban Pirates is a fun, outdoor, creative job. Come be a pirate! All staff is subject to criminal background checks. To apply, fill out an employment application available below. Once applications are received eligible performers will be contacted with an audition time and location. 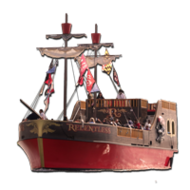 Urban Pirates employs experienced USCG Licensed Captains carrying a 50 ton Masters license or higher for our interactive Pirate-themed cruises aboard the pirate ship running out of National Harbor. All Captain and MROP paperwork must be up to date and valid. All staff is subject to criminal background checks and DOT pre-employment and random drug testing. Seeking charismatic and fun candidates to work regular week-day cruises May-September. Morning and evening shifts available, hours and working dates can be flexible. Must work well as a team player and have the stamina to work 6-8 hour shifts. To apply, fill out an employment application available below. Once applications are received eligible Captains will be contacted to arrange an interview. No pirate experience or elaborate costume required, just fun outdoor work. Come be a pirate!